31-W Insulation is your source for professional gutter replacement services in Kansas City, Missouri. We proudly offer and install seamless gutter systems that will look great and function flawlessly for years to come. Faulty gutters can cause rainwater to seep into the structure of your home and result in costly damage to its foundation. However, you can avoid all of these problems by turning to 31-W Insulation to have your leaking or damaged gutters replaced. Durable – Made from aluminum alloy 3105 H-15, our gutters are built to last. Additionally, the seamless design makes your gutters less prone to leaks and debris buildup over the years. Custom fit – Seamless gutters are unique in that they are manufactured, measured, and cut onsite with special machinery during the installation for a perfect, custom fit to your home in the Kansas City, MO, area. Aesthetically pleasing – You’ll have more than 20 color options to choose from for your replacement gutter system, so you’ll be able to select the look that best complements your home’s exterior. Plus, the seamless edges provide an attractive finished appearance that sectional gutters can’t provide. Protected with a warranty – We stand behind the quality of our products, and our seamless gutter replacement products are protected with a 20-year limited warranty to give you peace of mind in your investment. 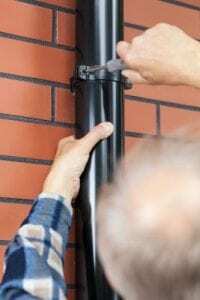 To learn more about the gutter replacement services and products we offer in Kansas City, MO, contact 31-W Insulation today.